Whiplash occurs when a person suffers a sudden impact that causes the head to snap forwards, backwards, or sideways. The violent force of this jerking motion causes the muscles, tendons, and ligaments to stretch or tear. Such injuries are sometimes classified as sprains or strains of the neck. Whiplash is most commonly the result of a car accident, but can also be the result of participation in contact sports like football, or from being the victim of an act of violence. Any time the neck is hyperextended or hyperflexed, a person is at risk for whiplash. Symptoms of whiplash include muscle soreness, stiffness, and tenderness. Victims also typically suffer reduced range of motion. Other common maladies associated with whiplash include headaches, dizziness, fatigue, jaw pain, numbness and weakness in the extremities. Some people with whiplash experience ringing in their ears, blurred vision, and memory problems, though these symptoms are less common. Many people ignore whiplash symptoms which may prolong or worsen their consequences. Those who blame the soreness and stiffness of whiplash on sleeping in an uncomfortable position and dismiss the pain as temporary often fail to seek treatment in a timely fashion. This can lead to more serious problems, including depression, anxiety, and sleep disturbances. It is important to seek medical attention and to treat whiplash symptoms as soon as possible after an accident in order to avoid complications. Doctors' opinions vary on the best way to treat whiplash symptoms. Different doctors may recommend icing the affected area, using painkillers or drugs to numb the pain, using a neck brace or collar to immobilize the neck, physical therapy and exercises to stretch the sore muscles, acupuncture, massage, or chiropractic manipulation. Many physicians may recommend a combination of strategies. Only a licensed medical professional is qualified to give advice on how to treat whiplash. An skilled attorney can handle the legal aspects of the accident to help ensure that the injured party can concentrate on the important work of physical recovery. The lawyer will obtain police reports, witness statements and other evidence to prepare a lawsuit against the individual responsible for the whiplash injury. The lawyer will also document medical expenses, seek approval for required tests, and file a claim or a lawsuit on behalf of an injured party. 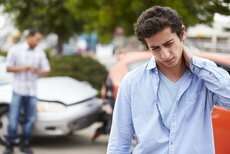 The lawyer’s experience in dealing with insurance companies ensures that victims of whiplash-related injuries are reimbursed for their pain and suffering as well as for their medical expenses.